If there is such a thing as a “professional road tripper,” all four members of our family might qualify for that distinction. On our first date, Alan and I went for a drive and that pretty much started our road tripping career. Luckily, our two kids (now ages 18 and 23) took to the open road quite easily when they were young and each has since driven, alone, on a long distance trip to a destination several states away from home. Since many of our days on the road were long ones on these cross country trips (which, I understand, doesn’t work for everyone), we always tried to find something of interest to the kids that would break up the day. As we made our way north from Buffalo Shores Campground in Iowa on a hot summer day, I spotted Clear Lake State Park on the map. For our family, one of the many advantages to RV travel is the fact that anything we might need is readily available – no sorting through suitcases for a sweatshirt or stopping for restaurant meals unless we specifically choose to do so. Having everything close at hand allows us to spend more time on the activities we enjoy – and I just love that. As we traveled through northern Iowa the opportunity to take a break at Clear Lake State Park was just too good to pass up. Within minutes of pulling into the parking lot, all four of us had changed into our bathing suits and eaten a quick lunch because . . . that lovely swimming beach was calling our names! I don’t recall how much time we spent at Clear Lake State Park that afternoon, but it was time enough to refresh our bodies and make a long day on the road a memorable one. 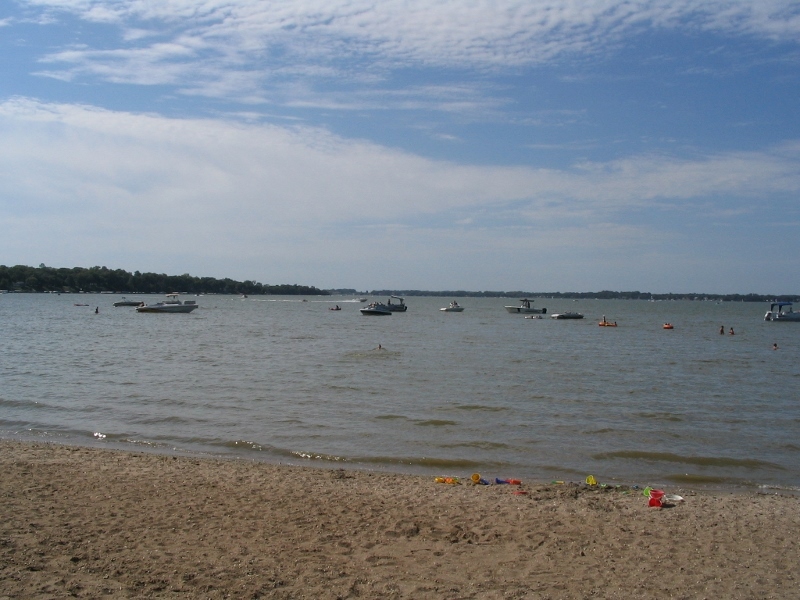 Since we already had campground reservations in Minnesota for that night, we didn’t explore the Clear Lake State Park Campground, but ReserveAmerica (link HERE) indicates that it has 180 sites and is one of the most popular campgrounds in the Iowa State Park system - despite the fact that the Park itself is only 55 acres in size. Boating and fishing are popular activities here and, due to our delightful afternoon at the sandy swimming beach, we’d return here again in the future. Based our family’s experience, State Parks often offer excellent opportunities for a break from the road – whether for a spontaneous picnic, a short hike, a refreshing swim or an enjoyable visit to the playground. The America’s Parks web site (link HERE) is an excellent resource for all things Park-related. If your taste runs less toward the Parks and more toward unusual tourist attractions throughout the country, then you may want to check out the Roadside America web site (link HERE). Both of these web sites allow you to search for just the right stop by state. Whether you’re planning ahead or just looking for a spontaneous adventure while on the road, either of these resources will prove helpful – but it’s up to you to remember the beach towels and the picnic basket! Please come back to visit in the future for more tales from our National Parks trips. And, if you have a favorite State Park or Roadside America attraction, please do share – just use the Comments section below!